After you get the hang of bidding on eBay, you may venture to the specialized auction areas. You can purchase a car or car parts and accessories from eBay Motors, or your own piece of land or a new home in the Real Estate category. eBay is always adding new specialty areas, so be sure to check the announcements as well as the home page. Should you reach the big-time bidding, be aware that if you bid over $15,000 in an auction, you must register a credit card with eBay. All items in the special categories are searchable in eBay’s search, so don’t worry about missing your dream Corvette when you use the Search page. Visiting the automotive area of eBay is an auto enthusiast’s dream. You can also find some great deals in used cars, and eBay offers creative ways to make buying vehicles of all shapes and sizes (as well as the largest array of parts you’ll find anywhere on the planet) easy. Visit eBay Motors by clicking the Motors category link on the home page. Clicking the Vehicle Buyer Services link on the left will bring you to all sorts of ways to shop for a car with confidence. Specialized search: If you want to search for cars without coming up with hundreds of die-cast vehicles, eBay Motors has its own search available from the eBay Motors home page. Here you can input makes, models, and your ZIP code to see if there are any vehicles available in your area. There is a separate search where you can find parts or accessories for your existing car. Vehicle shipping: If you don’t want to drive across the country to pick up your new vehicle, you can have it shipped through several eBay- recommended auto shippers. Check online for a free quote. Inspections: Many used-car buyers take advantage of eBay’s independent inspection vendors. These companies offer a comprehensive inspection covering the mechanical condition and cosmetic appearance, and they supply a detailed inspection report. Once you’ve found the perfect vehicle for you, you can scroll below the bidding area and click the link labeled Order an Inspection. Vehicle History Reports: With the vehicle’s VIN (Vehicle Identification Number), a seller can provide a free history report. If the seller has not offered this feature, click the Buy AutoCheck report link to order one on your own. A single report is $9.99, and a value pack of ten reports (for comparison shopping) is $14.99. Financing: Clicking the Get Low Monthly payments link, below the bidding area, will take you to the RoadLoans.com page to get an estimate. You can also apply for financing here for your purchase. The eBay Stores are a quick, easy, and convenient way to find items for sale that you can buy now. A large number of eBay sellers have opened eBay Stores for a monthly fee as an inexpensive way to display a large number of items for sale. They mostly carry fixed-price items and carry multiples of their items for sale. When you’re perusing the auctions on eBay, you’ll see the store listings mixed in with the auctions. 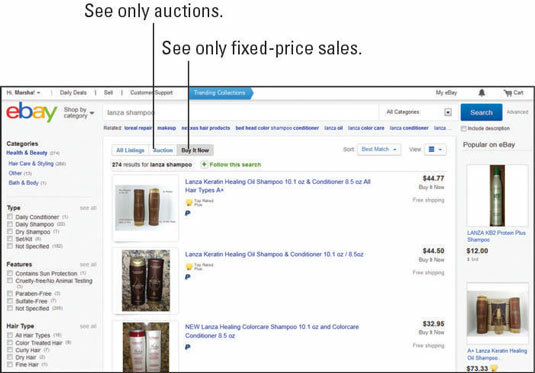 You can see the fixed-price listings by clicking one of the tabs at the top of a Search page or category listing.